Plata Latina Minerals is a Canadian exploration company focusing on discovering new silver-gold vein districts in the prolific Mexican Silver Belt. The Company is currently concentrating its efforts on advancing and adding to its portfolio of four silver-gold properties situated within the Mexican Silver Belt. 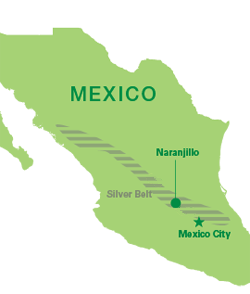 The Company’s first discovery, the Naranjillo is located approximately 35 kilometres on-trend and southeast of the world-class Guanajuato epithermal silver-gold vein district. The Company and Fresnillo plc have recently executed a purchase option agreement under which Fresnillo may acquire the Naranjillo property from the Company in consideration of an NSR and cash payments. The Company is now turning its attention to advancing and expanding its property portfolio. The Company’s extensive expertise in exploring high-grade Mexican silver-gold districts and the application of the “ore horizon” concept to that exploration provides a competitive edge for discovery of new districts between old historic deposits. Its highly experienced management team and board are focused on acquiring and exploring a portfolio of high-potential targets and exploring additional value-creation opportunities. Plata Latina trades on the TSX Venture Exchange under the symbol PLA.